What's it like to race at 120mph without moving an inch? 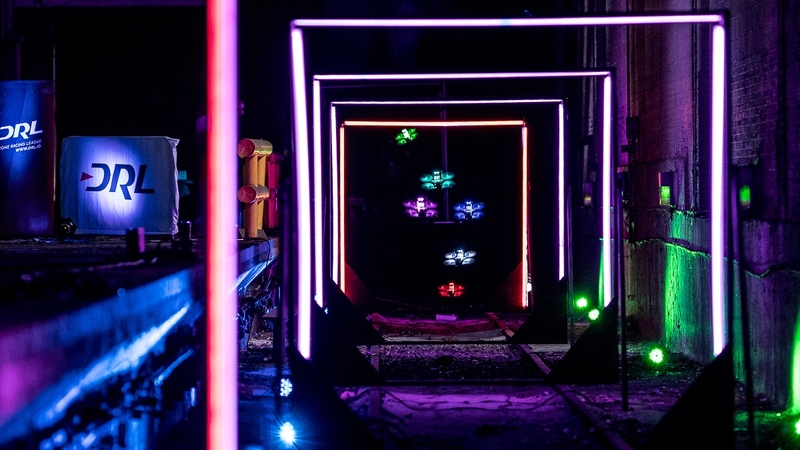 Look no further than The Drone Racing League (DRL). It's the world's only professional drone racing circuit where pilots go head to head in a series of FPV (First Person View) flights. Pilots fly radio-controlled drones equipped with cameras while wearing VR-like goggles displaying a live feed. It's a sport like no other and it's on the up. Starting out in 2014 as an amateur pursuit, in just three years it's become a hot ticket with six races of the 2017 Allianz World Championship to be aired on ESPN and Sky Sports this June. FPV goggles were around before the Rift, Vive and PlayStation VR showed up. Some are small and light with two lower res displays and head tracking, others use one HD display with a wide field of view, more like a VR headset. Many pilots prefer devices specifically made for the sport but headsets like Carl Zeiss' VR One have racing apps like CloudlightFPV and racers are experimenting with options like the Avegant Glyph too. We asked three pilots what's it like to race time trials, drag races and rotorcross obstacle courses at 120mph, how they got into drones, and what their hopes are for the future of the world's first wearable tech sport. How did you get into drone racing? I naturally got into drone racing due to a life long passion for radio controlled cars and planes. I grew up driving RC cars with my Dad, racing scale buggies in high school and flying airplanes after college but once I flew from the first person view of a drone, all other RC vehicles sat on the shelves. I was completely hooked. Is drone racing the most techie sport in the world? I think drone racing is definitely a tech-dominated sport. I live in Silicon Valley and all of my local drone buddies are engineers of some sort. Together, we're always modifying our drones, designing new components, and trying out new gear. How long did it take to get used to the goggles? My first FPV flight was terrifying; I had to land my drone prematurely because I was so freaked out. The second flight was much better since I knew what to expect. I think most new pilots can get used to the FPV goggles in one or two flights. Flying with a monitor before using goggles can help with disorientation. What is it like to race a quadcopter through the air? Watching the world blur past you while navigating around obstacles in one tenth of a second is a huge adrenaline rush. The mental focus required to fly at these speeds is intense. The only thing that comes close is riding a roller coaster, but on a coaster you're not in control. The game totally changes when you can go wherever you want! I'm completely addicted. How important is the FPV aspect of drone racing? It's arguably the most important bit. The tech allows us to see exactly what the drone sees from a first person view by attaching a camera and video transmitter to the drone, and with a receiver and a pair of goggles on the other end we view a live video feed with minimal lag or latency. With the two together it allows us to view or explore environments in places we couldn't ever dream of before, all while being completely immersed. Yes. Despite being sat still and using very little muscle work to control the drone, the mental drain from the sheer concentration is insane. How does drone racing differ from VR racing experiences? The idea of VR and immersion combined with racing with a competitive aspect is not a new one – we have similar technology available in gaming – but being able to transport that into real life racing means that it feels far more real. It also has huge advantages such as being able to race competitively without being in the cockpit directly. Crashing is part of our sport, we all do it – dozens of times per session usually – and so being able to do that with much less risk but still feeling like you're in it is such a weird but awesome feeling to have. And what does it feel like to crash? It's kind of weird because while we are used to racing at 120mph and it becomes a bit of a 'norm' when you crash, you still feel like you are directly inside the drone and we often flinch or close our eyes before impact. Tell me about the tech involved. One of the greatest parts about FPV racing is that it's a mish-mash of technologies. FPV drone frames have emerged as a somewhat new technology, while the FPV video system that sends a connection to our goggles is a security camera technology that has been around for many years. Beyond this, the control and power systems are very standard radio control hobbyist technologies. What does it take to be a pilot? While, yes, we do look like a bunch of nerds standing around in a field looking through our goggles, the wide array of personalities that are attracted to FPV continues to surprise me. Top pilots in the world range from tech nerds to extreme sports enthusiasts to mechanics to firefighters. My preparation is very focused on 'self.' My philosophy for racing is that you must fly your own race. Ignore everyone else, do the best that you have trained to do, and don't expect yourself to be supernaturally faster. The high barrier to entry of cost, skill, and knowledge brings the most passionate people together in the drone racing community and I want to spend every day helping foster that and growing the professional sport of the future. Interested in free style flying or zipping about at 120mph? There are drone racing meet ups all over the globe. Check out Fpvhub in the UK and MiniQuadClub and FPVlab for US groups. As well as the professional circuit, such as the DRL, a huge amount of drone flying's community get together, mark out a course, and post videos of their airborne ventures online so once you've got the kit it's all about networking. Just interested in watching? Visit the DLR website and sign up to their newsletter for all the latest info on upcoming races.